"Kill, maim, torture. All in the name of family. Always and forever." It's basic physics. For every action, there is an equal and opposite reaction. The Mikaelsons have gone centuries killing, maiming and torturing without any real repercussions. I'm almost into seeing them get a little of it served back to them. On the surface, at least. Elijah did just rip the heart out of someone that his brother vowed was family. 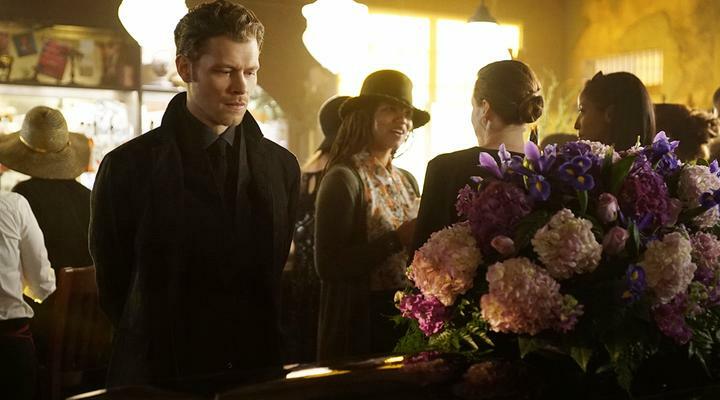 Klaus has broken hearts and spirits and the very will to live in some people probably on every continent. I'm willing to bet there is an Eskimo somewhere shivering in his igloo just wishing that he could pay Klaus back for some terrible wrong that he has done. But in the end, I'm not happy about seeing any of them actually bite the dust permanently. Even Kol and Freya aren't expendable to me. Aren't Elijah's tears enough pain for one season? It's very chicken and egg, the current Marcel situation. Was Elijah pulling Marcel's heart out the straw that broke the camel's back? Or was Marcel's mind already made up and that is what locked the prophecy down that Elijah saw and forced his hand to take action against his pseudo nephew? The whole bridge scene was heart-wrenching (a little too literally for Marcel) to watch. Klaus was trying so hard to reason with Marcel. In the past, I don't think he would've been so patient. He's trying to honor Cami's memory by being the kind of person she saw in him, but for Marcel it's all just too little too late. I kept wanting to yell at the TV, "Forgive him. Don't be stupid. He's trying so hard not to be an bully." Then when Elijah showed up, I knew he wouldn't be giving Marcel the same patience that his brother was, and I was just waiting for the whole mess to blow up. And did it ever. Klaus is pissed but no one can be more upset than Elijah is with himself. Very, very well done all around. The difference between Cami's Irish wake and Davina's cemetery send off was staggering, and raised so many questions. Would you rather there be a party through the street with lots of people ranging from soulmate and best friends to acquaintances and randoms you barely knew? Or would you prefer only the people that loved you very very deeply? A bright, boozy fun-filled affair or a solemn heartfelt gathering? I honestly don't know who got the short end of the stick here. Of course they are both still dead in the end so maybe no one did. Or both. Me so confused: Davina's soul wasn't obliterated. So much of her remained that she was able to take out the ancestors. All of them. Or at least their connection to the living. First of all, if they hadn't been such wicked little assholes they probably wouldn't have had anyone gunning for them in the first place. Much less have been taken out by two of their own. Former regents no less. Detective Kinney finally got a little to do. Here's hoping he either dies or gets a decent story line quickly. Jason Dohring deserves so much better. Such a good twisty episode. Wasn't quite a 4, but almost. The ancestors are gone. Not that I'm complaining, but it was a little anticlimactic. Almost like an afterthought tacked onto the episode. I hope we really have seen the last of them. You have to hand it to Marcel. The twist that he had already taken the potion was very Klausesque. And the student becomes the monster. I have a terrible feeling that Elijah will be sacrificing himself to save his siblings and Hayley, and I'm trying to brace myself for it. I start therapy on Wednesday. Kinney: "She was a special girl." Klaus: "There’s no polite summation that will do her justice. But you’re brave to try, and she would’ve admired that." Kol: "Give them hell, Davina Claire." Marcel: "Maybe you were the villains in his story. That's the Mikaelson way, right? Kill, maim, torture. All in the name of family. Always and forever." I get that he was upset but he spent a decent amount of time defending Lucien. The guy that murdered Cami. Marcel: "The thing about kings, though... eventually they all fall. Even you, Klaus." Hayley: "Klaus, after everything that you have done. All the people that you’ve threatened, tortured, killed, all the pain that you have put him through. He has always forgive you. You have to forgive him." Klaus: "You sound like Camille." The last 3 episodes of the Originals have really been edge of my seat TV. Unlike what happens in TVD here the stakes feel real which is ironic considering there's so many more unkillable immortals on this show. This episode moved pretty quickly considering that it was centered around two funerals. I was saying, go, Elijah! Kill Marcel before he can take the stuff -- but then he did, and I was shocked. Even though (confession) I've never liked Marcel, and I was fine with them writing him out. But of course, he took the stuff already and now he gets to be the big bad. Good on them, fooling us all this time, because of course, Marcel is friend, foe *and* family. Elijah and Hayley! At last. Again. It would be nice if they didn't artificially separate them in the next episode.